Crowdfund London gives you the opportunity to pitch new ideas - big or small - for community-led projects to make your local area even better. The Mayor wants to back the best crowdfunding campaigns with pledges of up to £50K. We want communities across London to come together to create, fund and launch projects that make a positive change in their local area. We know that our diverse communities are well placed to propose creative, distinctive and inclusive solutions to local challenges and opportunities. If you have an idea which will make your local area special, celebrate its character and bring people together then the Mayor could help you make it happen! You’ll need to be ready to run a crowdfunding campaign and pitch to our fund by 1st May 2019. The Mayor will pledge to campaigns towards the end of June/early July and if all goes well, you’d have your cash in the Autumn of 2019. We are running briefing events in late Feb/ early March - see the events tab to sign up! We are looking for innovative proposals that benefit the whole neighbourhood and show community support through a spirited crowdfunding campaign. The best could attract a pledge of up to £50,000 from the Mayor to help you hit your target and bring your idea to life. In 2019 we have up to £1m to support your projects and our fund will open in March, with information events happening in late February and early March. Complete our Expression of Interest Form so that we know you are interested and can directly support you and send you through relevant info on the programme. Click here to sign up to your local event or sign up to get updates on the programme. To be considered for a pledge, you need to have a project page finalised on Spacehive (which you can use to develop your idea with your community) and have applied to our fund by Wednesday the 1st of May, but you should aim to begin your campaign and secure your support as soon as possible. Let’s make your local projects happen! Why do we want to crowdfund London? We want to see more Londoners actively engaged in the process of improving our city. Thanks to new technology, people now have the chance to directly shape their city like never before. From social media to crowdfunding platforms, we can now all readily obtain the tools to organise, design, fund and realise civic projects that were once only accessible to professionals. City Hall can help ensure everyone has the opportunity to play a part in crowdfunding, amplifying the civic enterprise of Londoners. It also means together we can help create a fairer, more integrated society. We know that almost 40 per cent of Londoners have some involvement in local community activity. Over half feel community groups should play an active part in local community projects with nearly 80 per cent suggesting that this role should go far beyond basic consultation. City Hall has pledged over £1.7m to 103 crowdfunding campaigns across the capital since 2014. These were run by people just like you. Nearly 14,000 Londoners have come together to raise an extra £2.8m in pledges towards these projects.. Together, we’ve helped fund a range of community projects. For example, a study to turn an old rail track into a city garden, a community grocery store, a market to help unemployed people back into work and a community-led museum and training kitchen. All these projects show innovation and enterprise. They demonstrate active citizenship with an aspiration for wider social good. The impact of our experiment has been inspiring. These projects are helping people into work, improving health and wellbeing, breaking down cultural barriers, and bringing communities together around a common purpose. We are also seeing how the crowdfunding process is about more than just raising money. It’s about reaching out to the wider community, getting more people actively involved in their area, and building skills and knowledge through volunteering. This means the benefits go far beyond just the projects themselves. This year, we have £1m to pledge to your projects. Keep reading for more information outlining the Mayor's offer and then create your project and pitch to our fund from March. Follow our Movement, to be kept up to date with this and future opportunities. Projects could help to make your high street a better place to visit or do business, improve or establish a local market, give a new lease of life to an unloved space or empty building, improve access to healthy and affordable food or create a beautiful new green space or cultural feature that attracts people to the area. To get a better feel for the type of projects we’ve supported in the past, check out our success stories section. The best projects will aim to combine a few different elements and activities to improve impact and make a compelling case for Mayoral support. When considering whether to pledge to your project, we will assess four key areas; the quality of your idea and its likely impact, how you will get it done, the value for money and the level of local support. Projects should be ready to begin once funded. Tell us why we should be confident that your project will be a success and show that you have a clear plan (your milestones) and a team with the time and skills to get things done. If things are uncertain, or there are some risks, say so but explain how these will be managed as the project develops. Tell us why your idea should receive public funds. How will you maximise your impact? Can you ensure a longer term legacy for your project by considering maintenance and running costs from the outset? If it is a temporary project, can you recycle things once you have finished, to help someone else? Do you have any donated materials or labour that you don't need the cash for, but bring added value to your idea? If people are learning new skills, what will be the impact of that? How will the Mayor's pledge go a long way throughout the project? You will have chance to demonstrate this once you are pitching to our fund. Clearly outline any local support that you have for your idea. We will look at the number of pledges your campaign attracts (it's not about the money pledged, but the number and range of local backers) but you should also tell us why your local community are behind you. Have you done any surveys? Can you show support through comments on your project page or by signposting a blog or website with more information about those backing your idea? You will have chance to demonstrate this once you are pitching to our fund. Are you eligible to take part? We can only fund projects that are being delivered by a constituted organisation – we can’t fund individuals. If you are an individual, you would need to partner with an appropriate local organisation and develop your idea together. 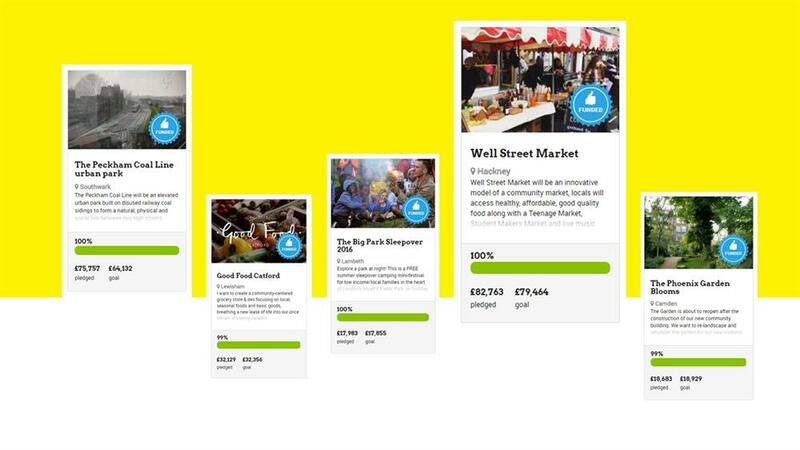 The Mayor will be pledging to projects that are pro-actively crowdfunding on Spacehive. The Mayor will only pledge up to £50,000 and no more than 75% of your total project cost, so you’ll need to raise at least 25% from the rest of the ‘crowd’ – people, businesses, pubic funders and so on. In reality the Mayor’s pledge will likely be less than this, so you need to think about the budget you need and what could be achievable when pitching your project as a campaign. 1. Prepare. Before you get started pease take the time to read through the information we have provided here and in more detail on the Crowdfund London website about the kinds of projects we are looking for, who is eligible, and the key timings of this initiative. Complete our Expression of Interest Form so that we know you are interested and can directly support you and send you through relevant info on the programme. Sign up to one of our workshops to come and find out more. Use our resources to help you. 2. Create your project page. You need to create a project page on Spacehive. This is your pitch for funding to everyone (us and the rest of the crowd). Use it to explain your vision clearly, get across your passion for your project, convince us you can make it happen and show how it will have a positive impact on the area. You should look to create your project page early, so you can refine it alongside your community and get assistance from Spacehive before finalising it. 3. Pitch to our fund. Our 2019 fund will open in March. You'll then be automatically matched to our fund when you create your project. You can then pitch for a pledge from the Mayor. You will need to answer a series of questions about you and your project and provide evidence for us to assess the eligibility and deliverability of your proposal. This should help you think through your project, but you must have completed your pitch by the 1st of May 2019 to be eligible for our funding and it will take you some time to scan and assemble documents to upload and answer our questions. You should aim to create your project and pitch to us well before the 1st of May so you have time to change things if you need to. 4. Get verified. Before you can start fundraising on Spacehive, your project will be verified. The verifiers will check through your project details on Spacehive to ensure you have all necessary permissions to deliver it. You must have submitted your final project for verification on Spacehive by the 6th of May 2019. After this date your project details will be locked and you wont be able to change anything. 5. Crowdfund. Get as many people as possible to show their support for your project by making a pledge - it doesn't matter whether they pledge £2 or £2,000. For us, the number of community backers you attract is as important as how much you raise. The latest date you can pitch to the Mayor's fund is the 1st May 2019 and submit your project for verification (to begin your crowdfunding campaign) is the 6th May 2019. The sooner you can start your campaign, the more likely you are to hit your target. The Mayor's team at City Hall will assess your project, and check how much support your campaign is getting, in ealy June. The Mayor will pledge directly to successful projects on Spacehive towards the middle of June. You must hit your crowdfunding target before your deadline to secure your pledges from the crowd. This is an 'all-or-nothing' model. Set your campaign deadline somewhere between 20th May and the 12th August to give yourself enough time to hit your target following a decision from the Mayor. 6. Make it happen! If you hit your target you’ll need to deliver your project by Autumn 2020. The regeneration team at City Hall will be on hand to offer advice and guidance but you must have resource in place to hit the ground running. You should plan your project delivery on the basis that you won’t receive any funds until Autumn 2019 at the earliest. Crowdfunding Stories introduces the Mayor’s Crowdfund London programme and brings together the experiences of the first wave of pioneering project creators helping to make their part of London better. 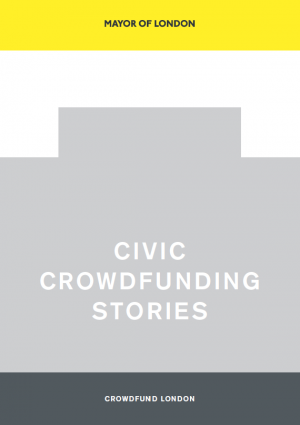 Download your copy of Civic Crowdfunding Stories here. Read on for some more of the amazing array of projects that have been successfully crowdfunded with the Mayor's support. This companion guide will help you to plan your project with your community. It is packed full of practical information, common pitfalls, hints, tips and inspiration to help you develop well considered neighbourhood projects that can succeed. The Coal Line is a community-led project that aims to better connect Peckham’s neighbourhoods: a 900m long park to link Queens Road and Rye Lane. The line will run on disused coal sidings alongside the railway line, through the heart of Peckham. The Peckham Coal Line captured the imagination of the whole community and reached its funding target after a successful crowdfunding campaign that also engaged businesses and the local council. They raised £75,757 from 928 backers. The Community Kitchen enables local start-up or home-based food businesses with the opportunity many have been seeking to explore the potential for a sustainable business future in cooking and catering. The Mayor pledged £17,000 alongside 60 local backers. Livesey Exchange is transforming 60 vacant garages on the Ledbury Estate into spaces for workshops, studios, cooking lessons and cultural activities where people can learn and socialise. The Mayor has pledged £20,000 to a total fundraising target of £53,252. An innovative model of a community market, locals will access healthy, affordable, good quality food along with a Teenage Market, Student Makers Market and live music stage. The Mayor pledged £20,000 to a total fundraising target of £82,763. A not-for-profit cafe will teach kids to cook and sell affordable healthy meals, with costs funded by a Community Pizzeria also helping to sustain Weavers Adventure Playground. The Mayor pledged £13,000 to a total fundraising target of £24,617. A monthly pop-up market event that puts a TWIST on the use of the road by Tulse Hill Station, creates a buzz for locals and provides a much-needed economic boost for the area and local residents. The Mayor pledged £14,000 to a total fundraising target of £34,072. Healthy juice academy and Root to Market programmes with a pop up market stall, helping the social enterprise to become self sufficient and teaching young participants valuable skills. The Mayor pledged £10,000 to a total fundraising target of £23,569. Re-landscaping and refurbishing the garden for new visitors, as the Garden is about to reopen after the construction of a new community building. The Mayor has pledged £10,000 to a total fundraising target of £18,683. PEER makes the experience of great art part of daily life. This project maximises visibility from the street, to entice and welcome audiences to enjoy exhibitions and participation programmes. Dramatically transforming the outward appearance, through replacing shopfronts with elegant, single-entrance facades and see-through shutters. The Mayor pledged £19,000 alongside 187 local backers to a total fundraising target of £44,657. A campaign to bring street art to the town, brightening up a grey High Street and creating community spirit. The Mayor pledged £11,000 to a total fundraising target of £24,701. Celebrating the island’s unique working boatyards & how it helped the British blues explosion of the 1960s. The Mayor pledged £8,000 alongside 138 local backers to a total fundraising target of £14,832. A healthy, sustainable fish & chips truck in the heart of the East End, will create pathways into entrepreneurship for young East Londoners. The Mayor pledged £15,000 alongside 186 local backers to a total fundraising target of £30,952. share the load: perhaps have someone looking after the budget and another the day to day management? For more guidance on engaging your community to develop your idea and tips to ensure you can make it happen, download our Community Projects Handbook here. February – Launch of Crowdfund London 2019 and events programme. You should start planning your project and building local support as soon as possible. March – Our fund on Spacehive will be open to accept pitches. First, you’ll need to create a draft project using the website. This will help you talk locally about your idea to refine it. You should look early at the kind of information required to pitch to our fund and write a list of things you need to resolve. April – Now is the time to refine your project page to best tell your story and finalise the details including costs. You should be planning your campaign to hit the ground running in September. 1st of May – Deadline to have Pitched to our Fund. The deadline to have submitted your project for Verification on Spacehive is the 6th of May. You can’t begin your campaign until your project has been checked and approved. Early July – Mayoral Pledges announced. 29th of July – Earliest date for crowdfunding campaigns to end – do not set your campaign to end before this date. Crowdfunding allows anyone to propose an idea and make an open, public call for people to come together to fund it. 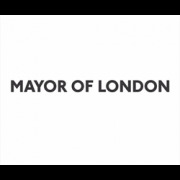 The Mayor’s partnership with Spacehive - the world’s first crowdfunding website dedicated to civic projects – means community organisations have the chance to pitch an idea that benefits their local community and attract financial pledges from other Londoners and the Mayor. Civic Crowdfunding is about more than just money. It’s a collective effort by people who network and pool resources. They invest skills and time together to make projects happen in their community. Backers might be local residents, local businesses, or even local government. They can pledge as much or as little as they choose, and only have to pay if the project reaches its target. If enough people like an idea and pledge a small amount of money, funds can grow quickly. With the Mayor’s support at an early stage, civic crowdfunding can help innovative local ideas get off the ground. Crowdfunding campaigns can require a lot of time, energy and enthusiasm to run successfully. However, the reward for making your idea happen, and attracting the support of everyone from local people and businesses to big brands and the Mayor, can be huge. Are there any fees to use Spacehive? Then there are transaction fees charged to projects by the secure payment systems that Spacehive uses - PayPal and GoCardless. Transaction fees are estimated on a ‘worst case scenario’ - all funders use the more expensive payment system (PayPal) and all funders make pledges of £20 (attracts the highest fee rate of 3.4% + 20 pence per pledge). In reality the funding scenario is more favourable with many funders using Go Cardless and pledging higher amounts which can bring the fee down to 1.4%. What kind of permissions will I need? This depends on the project, but you need to find out. In the first instance you need an in-principle consent from the landowner to support the project. Various planning permissions and licenses may be required and could be secured as the project progresses, but you need to be clear in your pitch that these will need to be resolved. How much detail should I put in my project budget? As much as possible. This will give clarity to your funders and help you plan. You should aim to split your budget into capital and revenue items where possible. The Mayor will be looking for specific items in your budget to fund as we will largely have capital funding available. You should aim to get three quotes for large items or services and check the cost of smaller items with reputable suppliers. This is to ensure value for money and a realistic budget. You need to think about VAT – often not included on quotes, but you will probably have to pay this in the first place even if you are registered to claim it back later. If you are registered to claim back VAT, City Hall will not pay VAT with our pledge and you will need to cash-flow this appropriately. You should plan some contingency into your budget for unforeseen extras / issues. This should be between about 5-10% revenue depending on the project. Most of City Hall’s money is for capital expenditure. This means that we will be looking for clear capital elements of the budget when considering our pledge. If your project is revenue based, that should not put you off, but be aware that you will be in strong competition for this. A project with a blend of elements is more likely to receive a pledge. Remember, all of your crowdfunding pledges will act as flexible revenue cash which can be used to support anything in your budget. What do you mean by capital and revenue expenditure? Revenue refers to funds that can largely be used for anything, but typically it describes funds for programmes of activity or day-to-day costs. If my campaign is successful, how will I receive my pledges? If your campaign is successful, most of your pledges from the crowd will be transferred in the week or so after the date that you hit your target. If you received and accepted a pledge from the Mayor, you will need to claim this from City Hall upon delivery of your project milestones. This means that you will need to manage a cash flow, purchasing goods and services with your other pledges, keeping the receipts and claiming back from the cost from City Hall to allow you to continue with later elements in the project. In some cases a group may not be able to cashflow a project effectively (such as a significant item that needs purchasing up front, without existing funds held by the group). In exceptional circumstances we can look for a solution, and you can flag this when applying to match to our Movement fund. How do I plan my cashflow? You need to think about splitting your project down into milestones (distinct deliverable tasks that would proceed in order) and mapping your budget and spend to these activities. This will help you to plan a strong project with the best chance of success. You should keep records of all of your spend and any receipts related to the project as you will need to show evidence to City Hall to receive your pledge. Your pledge from City Hall can be claimed in stages linked to your milestones. Do I need to report on progress? One the project has been delivered you will be required to fill out a simple evaluation of your project at the end which shows how you have delivered against your initial ambition, any challenges or issues you faced along the way, and lessons you learned as part of the overall experience. Whether this is your first time creating a project or you're a seasoned community organiser, these events will tell you everything you need to know to join in and have the best chance of attracting a pledge from the Mayor.